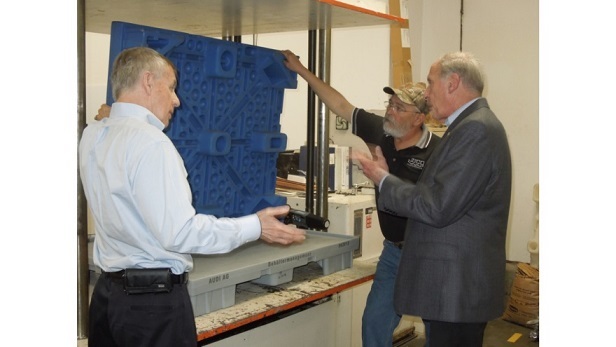 Jeco Plastics Products, LLC, founded in 1973 in Indiana, is an internationally recognized leader in the development and production of plastic pallets. When current CEO Craig Carson bought the company 18 years ago, he wanted to find ways to introduce real value and technology as a way to differentiate from competitors. With these goals in mind, Craig manufactured customizable and durable pallets, offering real value to customers by increasing productivity. With an established reputation at home, customers abroad acquired interest in Jeco’s products. While the printing market continued to shrink, Craig Carson knew that exporting overseas was crucial. Jeco’s first inquiries emerged from countries like Germany and Poland where there were specific markets for his products. But as a small company, he needed to make sure he was covered from the risk of buyer nonpayment. Craig Carson and Jeco Plastics sought EXIM for financial support to export abroad. With EXIM’s Multi-Buyer Insurance, Jeco Plastics was able to ship to countries such as Mexico, Germany, Poland, Czech Republic, France, Austria, and Switzerland knowing they were protected in the case of nonpayment. EXIM supported $3.9 million of Jeco Plastics’ exports from 2014 to 2018. The export credit insurance also secured cash flow from Jeco’s lender by borrowing against its foreign receivables.